Love Your Neighbor – suggestion or mitzvah? This past weekend the KKK, who are alive and well in Orange County, announced they were going to hold a rally against immigration in Anaheim under their “white lives matter” theme. First, it’s sad that the KKK still have an active presence here in Orange County and this hatred against the Jewish community and other minorities is still a part of our world. Our Torah teaches, “Do not stand idly by as your neighbor’s blood is shed.” (Leviticus 19:16) Professor Levin took this to heart and recognized that while this may not be his ideal neighbor, he could not stand by as others began to beat him. Last week, one of our own families sent me a picture of what they found on the front door of their Anaheim Hills home. 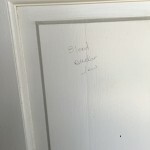 It says, “Blood Sucker Jew.” How would any of us feel to see this on our home? This family filed a police report as a hate crime and contacted the ADL. Still they are perplexed as to how could anyone in their neighborhood take such action as to deface someone’s home, let alone spew such hatred? Unfortunately, over the past many weeks it has become more evident that there has been a loss of decency in how people treat one another. People have easily forgotten to treat one another with compassion and respect. “Love your neighbor as yourself,” (Leviticus 19:18) the text is there as a clear reminder. Unfortunately, there is division, a separation in our society causing great intolerance. We are a few weeks away from Purim, the holiday in which we are reminded how one evil person was filled with hate and vengeance and sought to destroy the Jewish people. The courage of one woman to speak out and not allow Haman to prevail is a reminder for us, generations later. If Esther did not reveal Haman’s plot to destroy the Jews, Esther might have been spared because her Jewish identity was still undercover, but the Jewish people would have been destroyed. If we remain silent or indifferent to words and acts of hate, we are just as guilty as the perpetrators. “Love you neighbor as yourself,” this is not a casual suggestion, it is is a mitzvah, a commandment in which each of us have the responsibility to speak out for a return to decency and respect for all. It is no easy task, but then again, this is not a task for one person alone. Even all the Jews of Shushan stood behind Esther when she spoke up. We as a congregation and a Jewish community need to speak up together. During Purim we give sh’lach manot, gifts. This Purim, the gift we can give is one of a kind word, an act of respect, a moment of treating even the stranger with kindness. One act at a time can change the world for the better. 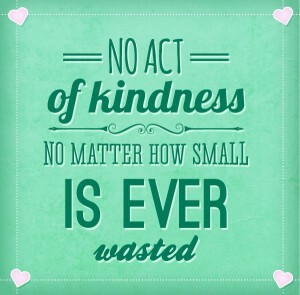 And when you perform these acts of kindness, share them here in the comments. Let’s inspire each other to bring back respect and compassion for all.